From the age of 10 I dreamed about having a brown and white cavalier King Charles spaniel. I begged and pleaded with parents for what felt like years about getting a dog, and always got the same sad answer of no. A dog just wasn’t in the cards for my parents, and as they knew I would be headed off to college, it wasn’t right for our family at the time. Fast-forward to just a couple of months ago when Rob and I toyed with the idea of just going to see a breeder with a new litter for “fun”. Rob’s family has two cavaliers of their own, so together we had always talked about eventually having one, but never did I dream it would happen this fast (a true lesson that you don’t go to see cavalier King Charles spaniel puppies and not fall in love with one!). The minute we saw our future little Pumpkin our fate was sealed. Those big brown eyes, those floppy ears, and that sweet demeanor that just makes you want to cuddle with them. We were sold! With my thoughts preoccupied with puppy collars, toys, and pumpkin accessories, I admittedly failed to do my research what dogs eat and the types of dog food out there. As a registered dietitian who knows a thing or two about human food, I was truly so confused when it came to dog food! Walk down the aisles of Petco and you would be too! And just as everyone has their two senses when it comes to a baby, everyone had their input on everything from food to puppy classes! While I greatly appreciated the knowledge of many other puppy parents, I remember feeling torn on what would be best for Pumpkin, the dog of my dreams, the little life that’s now in my hands, until I learned about SidebySide. After attending an event with the brand here in Chicago, I was immediately drawn to their transparent packaging and whole foods based recipe of protein and vegetables that I myself would eat. As RD who practices a whole foods approach, I really liked knowing that Side by Side honors nutrition from sourcing to formulation with clean and ethically harvested ingredients to build a foundation of health that honors pets. 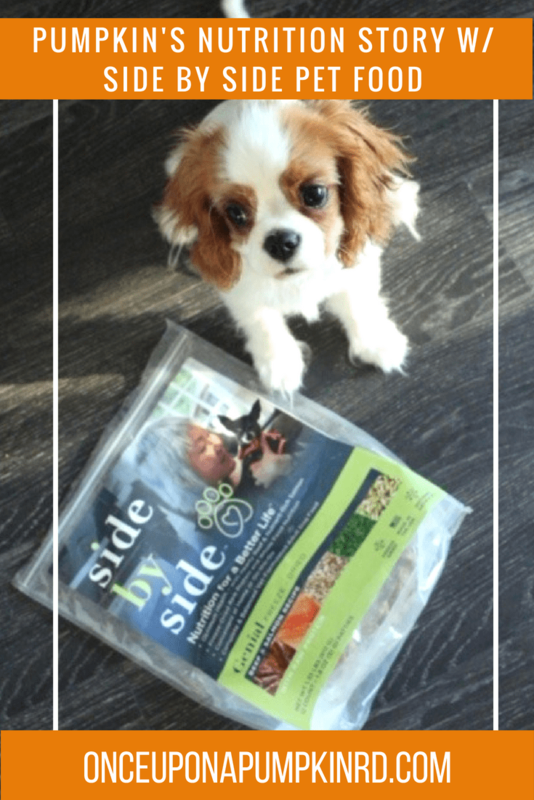 Started by a holistic veterinarian credentialed in Eastern and Western medicine, Side by Sides recipes are personalized to the pet, based on their stage of life and what’s best for them–an approach that we all strive to take with our own diets, so why wouldn’t we take with our four legged members of the family? The ingredients they use include, fresh, all-natural proteins like chicken, duck, beef, rabbit and fish, finely ground bones and organ meats such as hearts and liver. You can see actual vegetables including vibrant greens, carrots & sweet potato, fruits such as apples, and healthy fats, and herbs in the food. It’s prepared in small batches and rigorously tested to verify the best nutrition delivery, caloric intake, and food safety. Side by Side products are free from additives, toxins, carcinogens. As closely as I scrutinize my own food to be sure it’s free from similar additives, I want to make sure what I’m feeding Pumpkin is too, and with Side by Side I don’t have to worry. I had a lot of questions going into the personalized Pet Assessment with founder Marney Prince, especially because I knew a puppies’ diet might differ from the diet of a full grown dog. It was so interesting to hear first hand from her about the vitamins and minerals growing puppies need, and some interesting parallels between facts I know from my studies of human nutrition that she confirmed are also true for dog nutrition. We also had a fun time joking about the irony of Pumpkin’s name because pumpkin itself is in fact very healthy for dogs! Did you know that pumpkin could help remedy diarrhea and relieve constipation for them? According to traditional Chinese food therapy, pumpkin is a balancing, sweet, qi tonic that regulates blood circulation, and counteracts damp and phlegm. Signs of a qi deficiency can include tiredness, loose stool, reduced appetite, shortness of breath and more. Marney’s guidance and knowledge of key nutrients that puppies and dogs need put me at ease as we transitioned Pumpkin off of his lack-luster kibbles and onto Side by Side. Pumpkin seamlessly switched over without any issues. It’s really fun to watch him at mealtimes because excitement radiates throughout his entire body. He wiggles from side to side and always looks up for more! Check out this video that is the definition of licking your plate clean! And follow along on his Instagram, @pumpkingcav for more cute moments like this! It makes me so happy to see him enjoying his food and how good he looks and feels having been using the food for a couple of weeks now. Another major benefits of the food definitely worth mentioning is the fact that it’s nearly odorless and smells like real food! Pumpkin’s breath never smells either. He gives me lots of puppy kisses so I would know! Marney took the time to explain which nutrients are crucial for Pumpkin as he matures and what certain signs meant that put my worried dog mom thoughts at ease. She was also extremely knowledgeable on the unique characteristics of cavalier King Charles spaniels, pointing out health conditions and personality traits of the breed that can all be affected by the food they eat. Marney recommended a product formulated perfectly for his needs, a level of personalized care that I never knew was available for dog food, and truly something I couldn’t be happier giving it to him everyday. Click here to take the Side by Side Pet Assessment for your furry friend and to learn more about the difference real food can have on their quality of life. For more information on Side-by-Side, and a complete list of all of their products, visit their website, and check them out on social media on Instagram! Side by Side is available online and will first be available in premier pet stores in Chicago in the coming months followed by a national rollout this year. Pin more info on Side-by-Side for other dog mammas to learn about!